Well, Sunday afternoons for me are usually meant to be siesta time. This Sunday afternoon, I fought sleep and decided to attend an Indian Dog show hosted by the Blue Cross of India at the C.P. Arts Centre. It turned out to be an afternoon well spent, as the pictures in the coming posts will show. But let’s for a while, look at how the Blue Cross came about and what it is doing in the field of animal (dog, mostly) care. It was 50 years ago, in 1959, that a group of concerned people started a small advocacy group which was registered in 1964 as the Blue Cross of India. According to the 45th annual report of the Blue Cross, at the time of its founding, there were only two kinds of animal welfare organisations in India – the majority were goshalas for cattle and the rest were SPCAs started by the British. Most of the latter only prosecuted cases of overloading of animal-drawn vehicles or for using sick and unfit animals to draw these carts. The Blue Cross of India was the first of a new genre that considered that all animals under all circumstances had the right to be protected from cruelty at the hands of man. Captain V. Sundaram founded the Blue Cross. 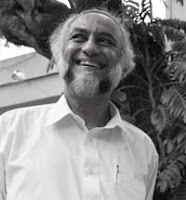 His son, Dr. S. Chinny Krishna, has been its chairman and editor of its newsletter for years now. Members include Usha Sundaram, Seetha Muthiah, Suresh Sundaram, N. Sugal Chand Jain, Nanditha Krishna, L. Nemichand Singhvi, Shantilal Pandya, Marion Courtine, R. Shanker, Malliga Ravindar, Viji Sundaram and a representative of the Animal Welfare Board of India. S. Haksan and Vittaldev Ravishankar are the honorary treasurers. During the last half century, the Blue Cross India has been primarily volunteer-driven and dedicated individuals who donate their time and expertise do much of the work on a purely honorary basis. According to Dr Chinny Krishna (picture above), Blue Cross activities have grown to such an extent that it is obvious that full-time committed professionals are needed to run the organisation on a day-to-day basis for best results. The Blue Cross runs shelters in Velachery Road, Guindy; Kunnam Village, Sunkuvarchatram in Kanchipuram; and Toducadu Village, Sriperumbudur-Tiruvellore Road, in Tiruvellore. It runs an animal birth control (ABC) programme at Lloyds Colony, Lloyds Road, and at Mount Poonamallee Road, St. Thomas Mount.